*Graduating students, click here to take the survey. 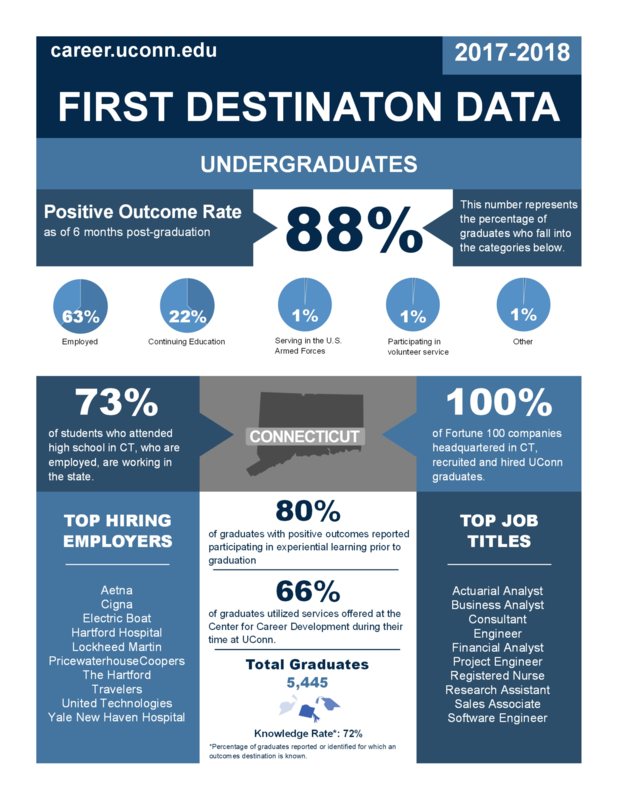 The Center for Career Development collects graduate first destination data based on nationally accepted standards dictated by the National Association of Colleges and Employers (NACE). NACE is the leading source of information nationwide on the employment of the college educated, and forecasts hiring and trends in the job market; tracks starting salaries, recruiting and hiring practices, and student attitudes and outcomes; and identifies best practices and benchmarks. In 2014, NACE developed national standards and protocols for colleges and universities to use in collecting and reporting graduating student career outcomes data. The result of this effort is NACE’s First-Destination Survey, which captures information regarding how new college graduates fare in their careers within six months of graduation. At a knowledge rate of 72%, our recent first destination survey shows that 88% of 2018 graduates have positive outcomes within 6 months of graduation. The below info-graphic outlines additional key information that has been collected and disseminated by the Center for Career Development.